প্রতিটি রবি প্রিপেইড সংযোগের জন্যে রবি দিচ্ছে ১৬ জিবি ইন্টারনেট । ৯ টাকা রিচারজে ১ জিবি ইন্টারনেট পভোগ করতে পারবেন ১৬ বার! With every Robi prepaid connection you can now enjoy 16 GB of attractive price internet! For the first time, you can buy 1 GB internet by recharging Easyload recharge of 9 Taka after 34 or 54 Easyload recharge. If you want to buy 1 GB internet pack at 9 taka, you must have first recharge of 34 taka or 54 taka. Recharge for the first time means that it has never been recharged before. 1 GB internet packs are prohibited within 30 calendar days from the day of purchase. If you recharge 9 Taka within 30 days, it will be accepted as the normal main account balance, and 1GB will not be allocated to the internet. USSD based data packs are for Prepaid and Postpaid General subscribers. Maximum timeout period will be effective if the recharge is done multiple times during the existing period. The default call rate (at the end of the recharge-based rate-cutter) will be 21 paisa / 10 sec. A handset will be eligible for an attractive offer of only one rechargeable (Tk. 34/9 / 54recharge) at the same time, even if there are multiple SIMs. 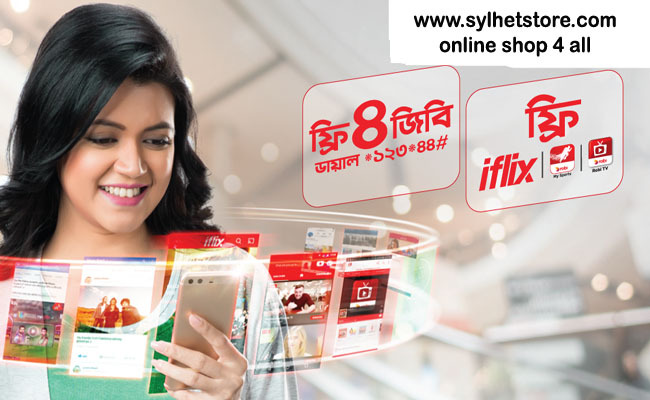 For each new Robi Prepaid connection, subscriber can enjoy 16GB of attractive price internet. Unused internet volumes cannot be used at the end. Customers from other package can’t migrate to this package. However, migration can be done from this pack elsewhere. If the migration to other Robi packages, the customer can use his existing data pack (if any). Robi can make changes to this offer at any time. Offer will be valid for a limited time. 5% supplementary duty, 15% VAT and 1% surcharge will be applicable on the original tariff.